Sylvania's new bus company takes over the transport network this week. This set features Olive and Stan, the driver and conductor, wearing their Woodland Bus Company uniforms. 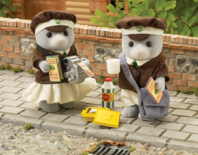 Also includes ticket machine for Olive to issue fares with, and a thermos and packed lunch for Stan to eat on his long journeys.